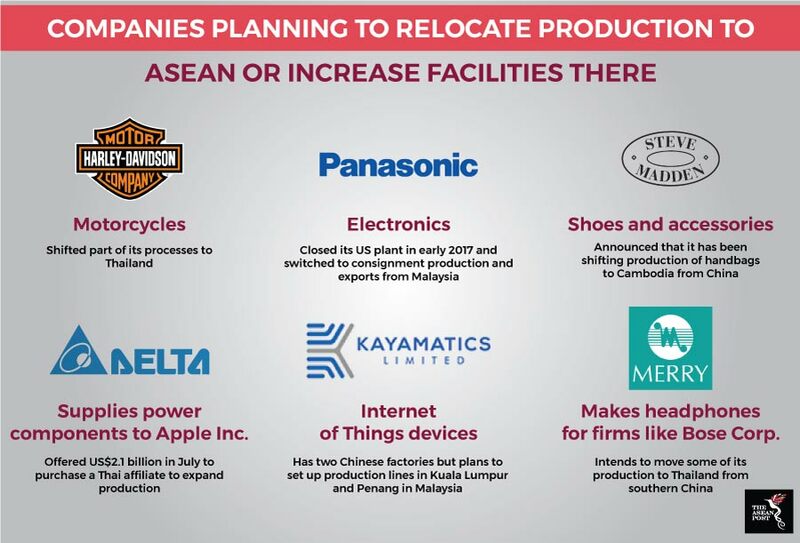 The relocation of production bases from China to ASEAN is perhaps the most notable benefit of the ongoing US-China trade war for the region. Over the past several decades, companies have flocked to China to take advantage of their low-cost production base and fast-growing middle class population with burgeoning spending power. But the Chinese economy is stalling and its targeted growth of 6.5 percent for 2018 is the weakest in almost three decades. With the US-China trade tension – which China’s Ministry of Commerce warned could be “the largest trade war in economic history to date” – disrupting supply chains, ASEAN is bracing for a surge in foreign direct investment (FDI). Although many manufacturers have already begun relocating production lines from China due to rising costs and tougher regulations, the US-China trade war is accelerating the trend. While companies will need time to shift their production bases, experts agree the China-centred supply chain network is looking to be a thing of the past. Overall, the US has placed tariffs on US$250 billion in Chinese products and has threatened an additional US$267 billion. China has responded with tariffs on US$110 billion in US goods. The two countries have called a temporary truce. “Given the escalating trade war between China and the US, many American importers are switching to buy from Vietnam,” said Nguyen Sy Hoe, Deputy General Director of Vietnamese furniture producer Phu Tai Corp. Counting Walmart as one of its customers, Phu Tai Corp. expects a 30 percent increase in its exports in 2019 and will invest about US$10 million to expand its factories and production lines to meet the rising demand. At a survey conducted at the 12th Asian Financial Forum (AFF) in Hong Kong earlier this week, Southeast Asia edged China as the region which would offer the best investment returns in 2019. Led by international audit firm Pricewaterhouse Cooper (PwC), the survey at the two-day forum found that 39 percent of attendees felt Southeast Asia offered the best guarantees of investment returns – with Vietnam leading the way. 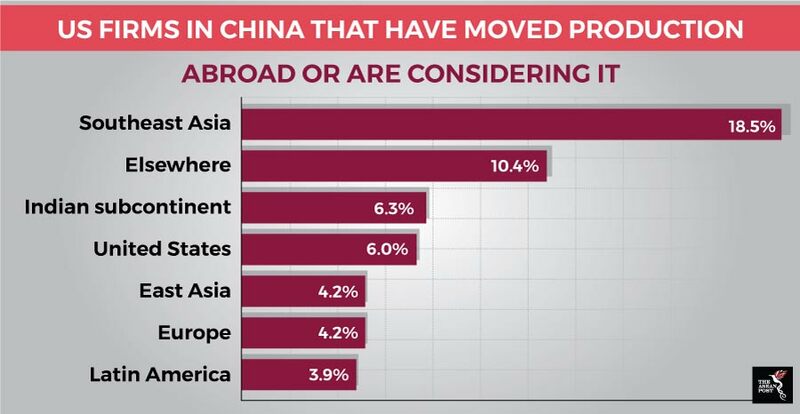 Around 35 percent still favoured China and another 16 percent chose the US. “This has much to do with what is happening around the world and that some CEOs are making adjustments to their supply chain in response to the current environment,” said Raymund Chao, Asia-Pacific and Greater China chairman at PwC, when referring to the trade war. Prime Minister Nguyen Xuan Phuc sees “more opportunities than challenges” for Vietnam from the trade tensions. The country is on the radar of South Korean medical equipment manufacturer IM Healthcare and Taiwan’s notebook PC maker Compal - both of which are mulling shifting production to the country. Thailand’s Eastern Economic Corridor (EEC) Office is coordinating a US$45 billion project to attract foreign investment and has already seen several scouting visits to potential factory sites. Across the region, corporations are increasingly positive about trade outlooks in view of the trade war. A HSBC report last year found that ASEAN firms have the most bullish trade outlook in the world with 86 percent of firms positive about their company’s foreign trade prospects – higher than the global average of 77 percent. “ASEAN corporates are overwhelmingly bullish on their commercial prospects and fully expect protectionism to rise,” said Tony Cripps, CEO, HSBC Singapore. Though Cripps said this seems counter-intuitive, he raised the question of whether ASEAN companies are underestimating the trade risks that come with rising protectionism or are seeing the trade disruption as an opportunity. “Either way, supply chain diversion is coming ASEAN’s way and corporates need to be ready,” added Cripps. Despite the ongoing rush to shift production, compliance to local regulations and the supply of human capital and raw resources will still be key issues for firms that plan on building new plants and expanding their capacities in the region. Throughout this production shift, the adoption of innovations such as artificial intelligence (AI) and robotics will help cut costs, increase competitiveness and enhance production. Increased promotion of the region as an investment destination, the development of more skilled workers as well as a streamlining of policies to ensure they are in line with international standards will do more to boost ASEAN’s standing among investors as the region bids to capitalise on the trade war.